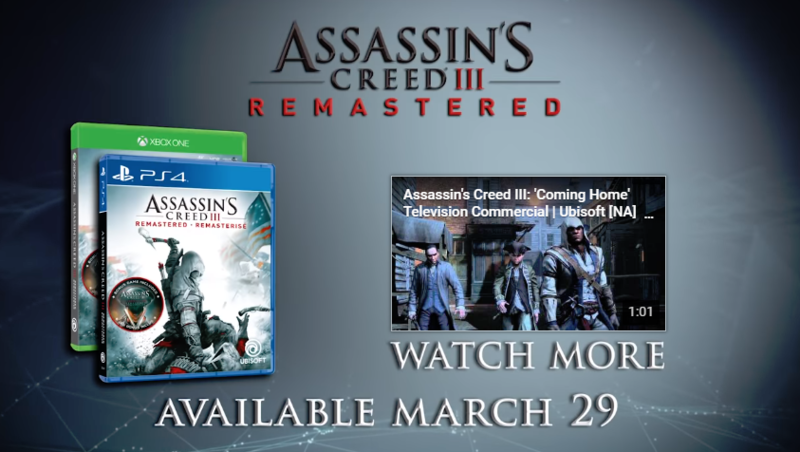 Assassin's Creed III serves as the final adventure for Desmond Miles and now gamers can relive the American Revolution this March 29th when the remastered version launches for Xbox One, PS4, and PC. Assassin's Creed III Remastered will include all previously released DLCs such as Benedict Arnold and Hidden Secrets and The Tyranny of King Washington along with Assassin’s Creed III Liberation Remastered. This version will feature 4K visuals and HDR support for Xbox One X, PS4 Pro and PC versions including other graphical improvements, gameplay mechanics, and, hopefully, fix Desmond's backpack so it doesn't clip. Assassin's Creed III is now available for PC, Xbox 360, and PS3. The remastered version will release this March 29th on Xbox One, PS4, and PC. Those with the Assassin's Creed Odyssey season pass will get the game for free.